It’s dark out and I’m just outside of Burlington, Vermont after having only a few hours sleep. Where am I? At Maple Wind Farm in Vermont. Why? Because Day Job (marketing and PR) has collided with what I’m passionate about – food and where it comes from. In this case, I was on the team promoting the partnership between Healthy Living Market and Chittenden Emergency Food Shelf. The market sources antibiotic and hormone-free turkeys from local farms. Maple Wind Farm is one of the only farms that also provides organic turkeys to the market. The farm consists of several properties where pastured chicken, turkeys, pork and beef are raised along with certified organic vegetables. 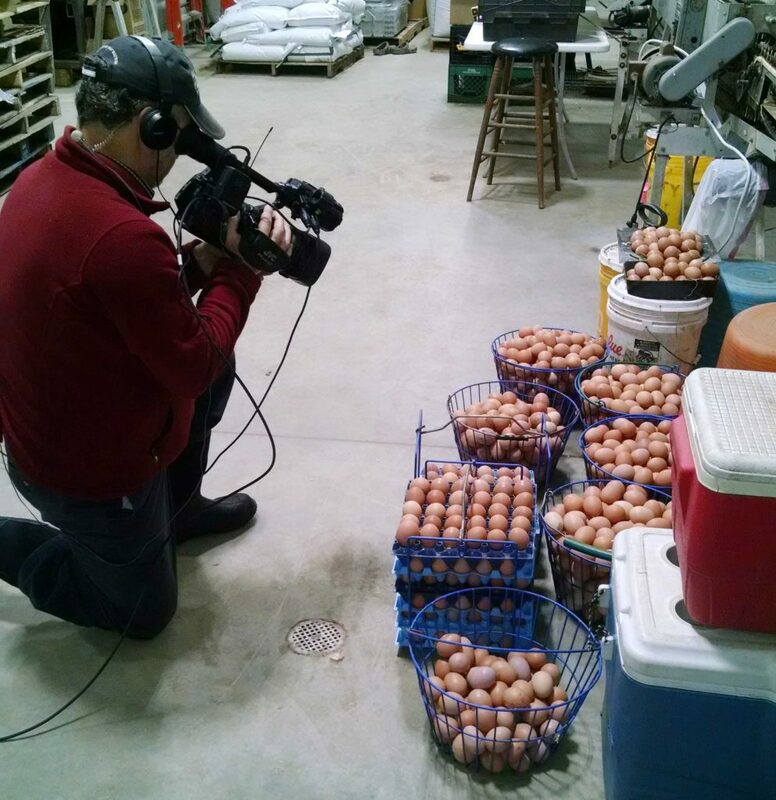 Can you imagine how many eggs 2000 chickens lay? Because I had helped coordinate the live morning broadcast with News 22/News 44 in Burlington, I made the trip over to meet the reporter, Alaina Pinto; the farmer, Beth Whiting; and coordinate final details with Healthy Living Market co-owner and general manager, Nina Lesser-Goldsmith. Viewers got to learn about Maple Wind Farm and how they could help to make sure that everyone has an abundant holiday table. How? On Turkey Pick-Up Day (November 22), shoppers can purchase non-perishable items to donate to Chittenden Emergency Food Shelf or purchase a $10 bag of pre-packaged items that will go to the Food Shelf. The market has another location in Saratoga Springs, NY and have partnered with a local food pantry (Wilton Food Pantry) there too. Beth explained that Maple Wind does a LOT to cater to the animals. They bring the food to the animals. They make sure the animals are protected and moved around the pasture so they can eat what they naturally are inclined to eat. Their diet is augmented with non-GMO feed AND they pay their workers a living wage. On top of all that, they process their turkeys on-site and a USDA inspector is there EVERY DAY during ‘turkey season’ to make sure the farm is compliant with all rules and regulations. I was really intrigued with how the turkeys are raised. They live in an enclosed, mobile structure in a pasture. Every few days they drag the structure to a new location in the pasture. It takes about 10 minutes to move 75 birds and they have plenty of room to roam around in the structure AND stay protected from predators. Cool, right? It really helps you understand why their turkeys cost a bit more than those that are raised conventionally. Beth is something else. Not only do she and her husband run the farm, she’s also at the farmers market, coordinating food orders from markets, doing payroll, is a mom AND manages to put together crockpot dinners for her workers. On our way out the door she gave us all a honeynut squash. I grow butternut squash and they can be a bit much for just Mark and I. Honeynuts are smaller and absolutely delicious. Roasted honey nut squash with butter, salt, pepper and maple syrup. Yum! I am glad I got to visit Maple Wind Farm. I highly recommend getting to know your farmers by supporting your local farmers market, food co-op, healthy market or visiting them. It’s true. No farms. No food. 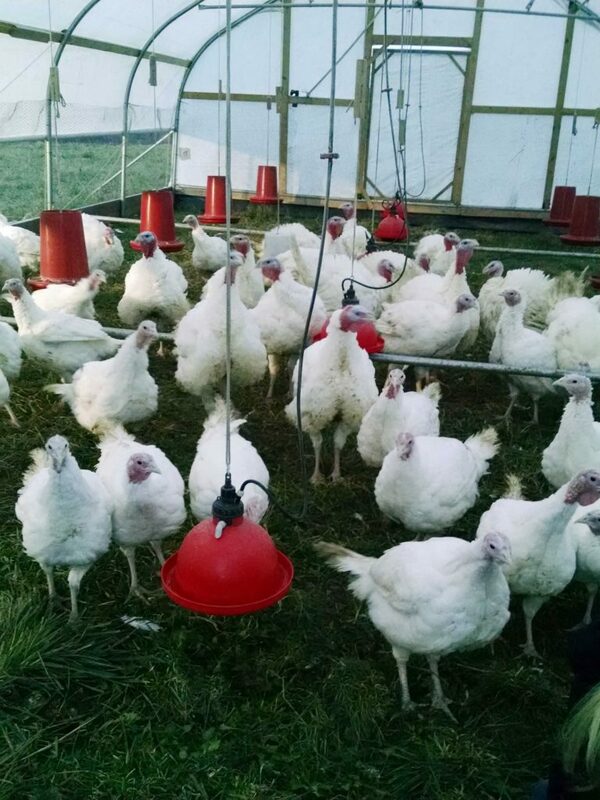 If you want to check out all the News 22/News 44 clips from the farm, check out this link – Where’s Your Turkey From? Kim , great post! loved the attention to detail to our operation and the photos! I wanted to eat your squash right off the screen. I have mad respect for what you and your family do. Thanks for the squash. It’s our new favorite! Will be growing it in my garden next year!